Check out some shots from today! Grades for the fifth and sixth grade students are available at all times on Engrade. Grades are stored online and can be accessed by any computer on the internet. Each student has his/her own account and must log on with a username and password to see their grades. If students and/or parents have a question their grades, all they have to do is follow the link to the Engrade website. Students set up their accounts yesterday, so now their grades are available on line 24/7 for science, social studies, reading, and writing. We used Engrade last year, and students really liked being able to access their grades whenever they want. Each day, students can check their grades during language arts class, at home, or in the Laurelville Library. Students that want extra credit can write an essay to be used in class during Rambunctious Reading. Currently we are using an adaption from Harris and Me, written by Gary Paulsen. Students are enjoying living through the scene where Harris and Me dive bomb the pigs as they pretend they are at war. Great job to our Study Island Students of the Day--Connor H., Josh P., Kari W., and Justin H.
Today is the best day of the year for a lot of students. They have fun with their grandparents/grandfriends. They get to spend time with their grandparents at school, in their classes. Some grandparents travel a long way to get to visit with their grandchildren and participate in class. We had 29 grandparents/grandfriends join our class today. Thank you for joining us. Students worked hard preparing letters, poems, and journals. 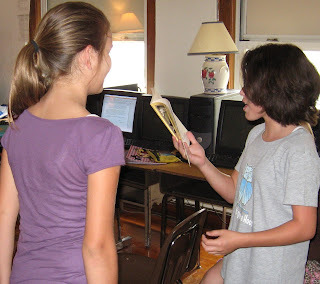 They enjoyed sharing them, and even received extra credit for reading them aloud. AND, the best part--at the end of the day, students got to leave with their grandparents. I am always looking for new and exciting ways to make learning fun. One method we use daily is singing in the classroom. Students sing as they read the lyrics. Now, we have another way to actively learn to read. 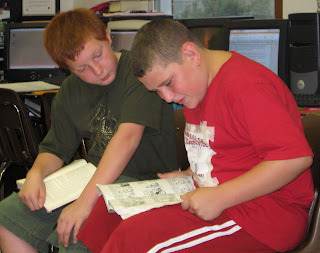 Rambunctious (energetic, boisterous, lively) Reading is a method where students work in pairs to improve their reading. 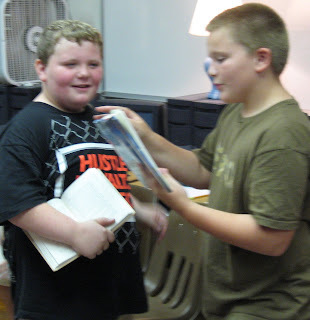 One student acts out the words as he reads. 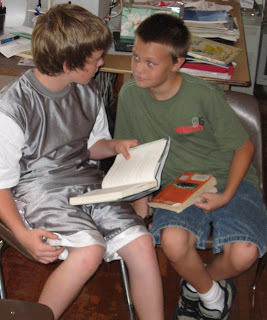 The listener actively listens, affirming thoughts and statements, and commenting to the reader. 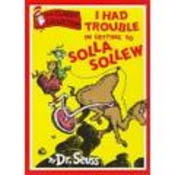 We are reading an excerpt from I Had Trouble in Getting to Solla Sollew by Dr. Seuss. Students having been ouching from kicking a hard rock and sailing along. This active reading gets everyone involved--even boys that start the morning looking a little rough. Great job to our Study Island Students of the Day--Jacob T., Dustin C., Emily S., and Trevor G.
Today is a beautiful, sunny, Monday. Usually it seems like we are slow to get back at it, but everyone seemed wide awake. Progress on letters was excellent. Mrs. Riddle, the school principal is forming a school leadership team. Congratulations go out to our sixth grade students that are part of this team--Trevor G., Scotty D., Chris T., Katie W., and Dillon Y. Ever want a view of paradise? This is as good as it gets. Extra Credit Question--Compare Aiden Falconer from On the Run with a character from another book. How would you describe yourself as a reader? That is the challenge facing students with the next project. 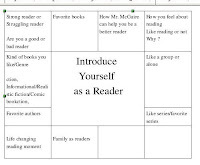 Students are writing a letter in which they examine themselves as readers, explaining likes and dislikes in the process. We used a lotus diagram to help get started. Just click on it for a better view! Credit for the lotus diagram goes to Mrs. Stevenson. Thanks for the idea! Students finished their letters today on the topic, "Reasons Why I Liked the Book." The following is a letter by Dillon Y. that is a good example of what I was looking for with this project. I just started reading it but I love my SSR book. My book is The Revenge of the Shadow King by Derek Benz and J. S. Lewis. It Is a really good book and I would recommend it to others. I like my book because it keeps you guessing, like when the Shadow King attacked Max you thought he was in trouble but it was just a dream. Also, it's kind of like a mystery; Max and his friends, Ernie and Natalie, have to solve why the Shadow Goblin is attacking Max, which keeps me in suspense. They also have to solve why the Codex (magical book) was in Max's grandma's attic. The last mystery they have to solve is why Sprig wanted Max to release an evil shadow. There are also several evil monsters, like the Shadow King, and all his Faeries, which are Goblins and other things which is cool because I really like reading stuff like that. The evil monsters are all ruled by the Shadow King and Oberon who are also evil monsters. It also keeps me wondering what will happen next. Like one time Max was falling off a water fall towards rocks and you thought he was dead but Sprig the the magical Spriggan swooped down out of the air and saved Max. A Spriggan is a magical bird/monkey that came out of the Codex when Max opened it to Sprig's page. Sprig helps me like the book because he is funny and always does something you don't want him to do unless you tell him in detail. Like when Max told him he wanted to go somewhere else he took Max to a place where he could not breath. The final reason why I like this book is because it's a series, so it will be fun to read the remaining books and see how the story develops. All of these are reasons why I love my SSR book and would recommend it to others. Many of the letters were interesting with good supporting details based on facts from the books students are reading. Great job, sixth grade! Don't forget, Reading Logs are due on Friday. Students must read at least 4 times a day for at least 15 minutes each day to get a C. To get an A, students must read at least 180 minutes for the week. We discussed how everyone has special talents and skills inside them. Students recognized that reason to live doesn't just mean staying alive, but means getting the most out of life. Success comes from not giving up, extra effort, and hard work! 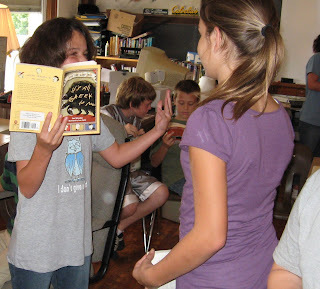 Students--for extra credit in reading comment about our read aloud book by Gordon Korman on today's blog with a prediction of what will happen if Aiden and Meg from On the Run, Chasing the Falconers try to find Frank Lindenauer. Great job to all Laurelville Elementary students for their hard work, especially considering the heat. Yesterday the top floor was above 90 degrees for much of the afternoon. The fact that we have 75 computers in the three language arts classes only adds to the heat. Students showed remarkable determination working through the afternoons all this week. I am proud of their effort and great attitudes. The weather is supposed to break soon, and this should make it much easier for everyone to concentrate. Every student turned in their Reading Log. Great job, 6th grade! We sing daily in reading class. The lyrics are shown on the wall with a DLP projector. Students read the words as they sing. This helps students build fluency. They learn to read words in chunks, and look for familiar phrases. We also work on vocabulary. Since we started this several years ago, it has consistently improved students' reading levels, and improved test scores. It also is a great way to learn while having fun. Currently we are singing Welcome to the 60's. This is from the movie Hairspray. We are revising the friendly letters. We have been working on writing on topic, and supporting that with details from the book. We are also editing with focus on capitalization, punctuation, and correct letter format. When this unnamed student (Shayna) brought up her paper, every I on the page was in cap's. The NOTES now say, "I when used as a word." She made my afternoon and I am still smiling about it. Congrats to our Study Island Students of the Day, Shelby C. and Caleb F.
Read at Home Logs are due tomorrow--Friday, September 7. Today we focused on the letter project. The topic of the day was adding details that support your thoughts, ideas, and opinions. 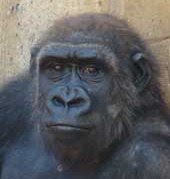 We discussed the W's--what kind, why, when, who, where, and how. This should give letters about SSR books a lot more information, and make them more interesting. Congrats to our Study Island Students of the Day, Alina S and Josh P.
Also, good job to Scotty D. for answering the Question of the Day! Grades will soon be available at all times on-line at Engrade.